Hi, I'm Debi, from Texas. 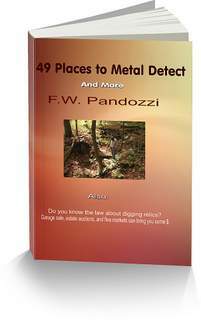 I love metal detecting, but haven't been able to detect for awhile. The ground here is too hard to dig (we need rain, BAD)! I will just have to show you my best finds from a camping trip to a local lake (50 miles away). I found these rings at a swimming beach. The woman's ring was around 4 inches down. I didn't find the second ring till I came back by rechecking the area where I found the first ring. I was really surprised to find 2 rings in the same hole! I have a niece that likes to detect with me at the swimming beach (she likes to dig in the sand). She will be surprised this year because I have a spare detector (Bounty Hunter VLF) for her to use this year. It is the same detector I found the rings with! I'm waiting for spring camping so we can detect the swimming beaches again! Hey Norm, hope all is well. If you have a problem posting pics just email them to me. Hello Friends, I have been unable to use my detector for some time now, will try to get a picture posted of some of the treasures I have found over the past few years, searching when I can, which unfortunately isn't as much as I want. Thank you for this site. Debi, good to hear from you! Debi, get your detector outa the closet and go find some stuff! I've been treasure hunting quite a bit. And, still doing some filming. Still shopping the TV show to the networks. Same old BS though. Everyone loves what I have, but they won't take us on. The TV industry is very political. You can have the best show ever produced, but if you don't know someone, it'll never happen. I guess Bridezilla and the Kardasions is the mentality of TV people today. anything from you in a long time! & moved here from Houston in 1991.
in a long time. I need to get back into it! Norm, send them when you can. Be sure and add a brief note that I am attaching to your comment here. detector99@yahoo.com - I'll try to post them here for you. Keep on detecting Norm, and let us know what your finding. Hi Debi, thanks for stopping by again. Hope you are doing well! sure Frank could tell you. thanks for the note and pictures debi, wish i knew how to send pictures on a page like this, ive been detecting for years, i use a whites unit, love it. 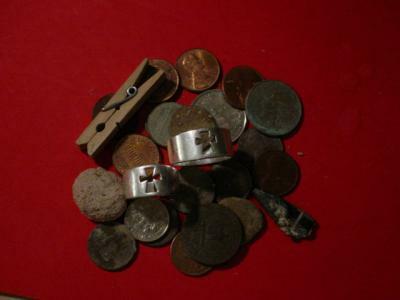 my detector doesnt like gold items, loves silver or aluminum and pennies, ive found several old lincoln wheat back cents using it. i live near the california / nevada border, 80 miles north of reno nev. i go to the black rock desert and smoke creek deserts to hunt, along with metal objects i also find arrow heads, having a ball with my detector im 73 and cant do much else besides hunt treasures, thanks for listening norm w.
Debi, thanks for the story and the pic.I know what you mean about "hard ground." The weather here in NY is terrible and the ground is frozen, so I am doing reserach. Your finds go to show that if you get out there you will find stuff. Thanks again! Stay in touch!